Farkas, E. 2014. Bibliography of foliicolous lichenized fungi, 1952–2013. Acta Botanica Hungarica, Vol. 56, Issue. 1-2, p. 33. GIRALT, Mireia KALB, Klaus and ELIX, John A. 2010. Buellia nordinii, a new triseptate species from Venezuela. The Lichenologist, Vol. 42, Issue. 03, p. 297. Egan, Robert S. 2010. Recent literature on lichens—217. The Bryologist, Vol. 113, Issue. 2, p. 390. Černohorský, Z. (1980) RNDr. Ing. Antonín Vězda, CSc. – 60 let. Preslia 52: 367–371. Farkas, E. E., Lücking, R. & Wirth, V. (eds) (1995) Scripta Lichenologica – Lichenological Papers Dedicated to Antonín Vězda. Bibliotheca Lichenologica 58: 1–501. Farkas, E. & Vězda, A. (1987) Macentina borhidii, eine neue foliicole Flechte aus Tansania. Acta Botanica Hungarica 33(3-4): 295–300. Grummann, V. (1974) Biographisch-bibliographisches Handbuch der Lichenologie. Lehre: J. Cramer, Hildesheim: Verlag Dr. H. A. Gerstensberg. Halda, J. P. & Vězda, A. (2007) A list of new taxa of lichens and lichenicolous fungi published by Antonín Vězda 1958-2007 by himself or together with co-auctors [sic!]. Acta Musei Richnoviensis, sect. natur., 14: 69–92. Kalb, K. & Vězda, A. (1988) Neue oder bemerkenswerte Arten der Flechtenfamilie Gomphillaceae in der Neotropis. Bibliotheca Lichenologica 29: 1–80. Kocourková, J. (2009) Antonín Vězda. 25 November 1920 – 10 November 2008. International Lichenological Newsletter 31(2): 28–29. Krahulec, F. & Palice, Z. 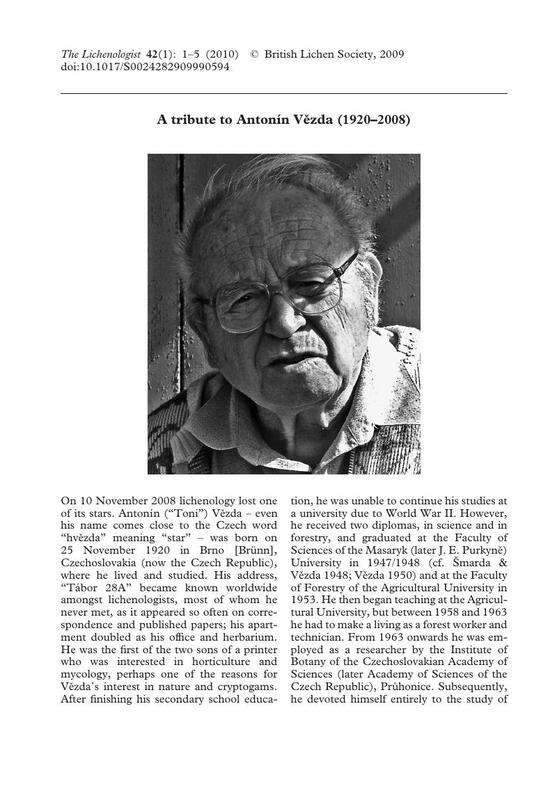 (2006) Antonín Vězda – 85 years. International Lichenological Newsletter 38(2): 17–18. Lücking, R., Stuart, B. L. & Lumbsch, H. T. (2004) Phylogenetic relationships of Gomphillaceae and Asterothyriaceae: evidence from a combinedBayesian analysis of nuclear and mitochondrial sequences. Mycologia 96: 283–294. Pišút, I. (1990) RNDr. Ing. Antonín Vězda, CSc. – 70 rokov. Preslia 62: 376–377. Pišút, I. (2001) RNDr. Ing. Antonín Vězda, CSc., octogenerian. Biologia (Bratislava) 56: 458–460. Poelt, J. (1993) Presentations of the Acharius medals on 3 September 1992 in Båstad, Sweden: speeches. Antonín Vězda. International Lichenological Newsletter 26: 31–32. Poelt, J. (1995) Antonín Vězda – der Mensch hinter dem Werk. Bibliotheca Lichenologica 58: 1–4. Poelt, J. & Vězda, A. (1977) Bestimmungsschlüssel europäischer Flechten. Ergänzungsheft I. Bibliotheca Lichenologica 9: 1–258. Poelt, J. & Vězda, A. (1981) Bestimmungsschlüssel europäischer Flechten. Ergänzungsheft II. Bibliotheca Lichenologica 16: 1–390. Šmarda, J. & Vězda, A. (1948) K poznání a ochraně krajinného rázu údolí západomoravských řek. 1. Údolí Jihlavky u Templštýna. Ochrana Přirody (Naturae Tutela), Praha, 3: 101–104. van den Boom, P. P. G. & Vězda, A. (2005) Gyalecta canariensis sp. nov., a new lichen (Ascomycota) from La Palma (Canary Islands). Mycotaxon 92: 255–258. Vězda, A. (1950) Vegetace na rokytenském slepenci v oblasti řeky Rokytné. Vlastivedny Věstnik Moravsky 5(2): 1–16. Vězda, A. (1958) Československé druhy rodu Gyalecta a Pachyphiale s kličem a přehledem evropských druhů. Sborník Vysoké Školy Zemědělské a Lesnické v Brně [Acta universitatis agriculturae et silviculturae, Brno]. Ser. C 1: 21–56. Vězda, A. (1960) Flechten der tschechoslowakischen Karpaten III. Ergebnisse der lichenologischen Durchforschung im tschechoslowakischen Teile der Karpaten im Jahre 1958. Biologia (Bratislava) 15(3): 168–182. Vězda, A. (1964) Lichenes Selecti Exsiccati, Editi ab Instituto Botanico Academiae Scientiarum Čechoslovacae, Průhonice prope Pragam. Fasc. XII. (No. 276–300), 6 pp. Vězda, A. (1967) Taxonomická studie lichenizovaných hub čeledi Gyalectaceae sensu Zahlbruckner. I. Rody Gyalecta Ach., Gyalectina Vězda, Pachyphiale Lönnr. a Dimerella Trevis. Dissertation for the Candidatus Scientiae degree, University Karlovy Praha [Charles University Prague]. Vězda, A. (1973) Foliicole Flechten aus der Republik Guinea (W-Afrika). I. Časopis Slezskeho Muzea [Acta Musei Silesiae], Ser. A. (Opava) 22: 67–90. Vězda, A. (1975) Foliicole Flechten aus Tanzania (Ost-Afrika). Folia Geobotanica et Phytotaxonomica (Praha) 10: 383–432. Vězda, A. (1978) Lichenes Selecti Exsiccati Editi ab Instituto Botanico Academiae Scientiarum Cechoslovacae, Pruhonice prope Pragam. Fasc. LXIII (no. 1551–1575), 7 pp. Vězda, A. (2004) Notes on the exsiccatum “Vězda: Lichenes rariores” with Index to fascicles 1–50 (Nos. 1–500). Czech Mycology 56(1-2): 151–162. Vězda, A. (2007) Gyalideopsis pandani (lichenisierte Ascomycota, Gomphillaceae), eine neue Art aus Papua New Guinea. Bibliotheca Lichenologica 96: 305–309. Vězda, A. (2008) Vězda: Lichenes selecti exsiccati (1960-1991) Alphabetical index to all 2500 edited taxa of lichenized or lichenicolous Fungi. Sauteria 15: 571–596. Vězda, A. & Vivant, J. (1972) Lichens épiphylles des Pyrénées-Atlantiques. Bulletin de la Société Botanique de France. 119: 253–258. Vězda, A. & Poelt, J. (1987) Flechtensystematische Studien XII. Die Familie Gomphillaceae und ihre Gliederung. Folia Geobotanica et Phytotaxonomica (Praha) 22: 179–198. Vězda, A. & Liška, J. (1999) Katalog lišejníků České republiky. (A Catalogue of Lichens of the Czech Republic). Průhonice: Institute of Botany, Academy of Sciences of the Czech Republic. Wirth, V. (1995) Begegnungen mit Antonín Vězda, mitgeteilt anlässlich seines 75. Geburtstages. Aktuelle lichenologische Mitteilungen 11: 1–4. Wirth, V. (2009) Antonín Vězda, der Lichenologe (1920–2008). Herzogia 22: 5–15.